The first upgraded version of the original Tu-154, the A model, in production since 1974, added center-section fuel tanks and more emergency exits, while engines were upgraded to higher-thrust Kuznetsov NK-8-2U. Other upgrades include automatic flaps/slats and stabilizer controls and modified avionics. Max. takeoff weight – 94,000 kg (207,235 lb). There were 15 different interior layouts for the different domestic and international customers, seating between 144 and 152 passengers. To discern the A model from the base model note the spike at the junction of the fin and tail. This is a fat bullet on the A model, and a slender spike on the base model. As the original Tu-154 and Tu-154A suffered wing cracks after a few years in service, a version with a new, stronger wing, designated Tu-154B, went into production in 1975. It also had an additional fuselage fuel tank, additional emergency exits in the tail. Also, the maximum takeoff weight increased to 98,000 kg (216,053 lb). Important to Aeroflot was the increased passenger capacity, hence lower operating costs. With the NK-8-2U engines the only way to improve the economics of the airplane was to spread costs across more seats. The autopilot was certified for ICAO Category II automatic approaches. Most previously built Tu-154 and Tu-154A were also modified into this variant, with the replacement of the wing. Maximum takeoff weight increased to 96,000 kg (211,644 lb). 111 were built. A minor modernization of Tu-154B-1. The airplane was designed to be converted from the 160 passenger version to a 180 passenger version by removing the galley. The procedure took about 2 1/2 hours. Some of the earlier Tu-154Bs were modified to that standard. Maximum takeoff weight increased to 98,000 kg (216,053 lb), later to 100,000 kg (220,462 lb). Some 311 aircraft were built, including VIP versions. A few remain in service. The Tu-154S is an all-cargo or freighter version of the Tu-154B, using a strengthened floor, and adding a forward cargo door on the port side of the fuselage. The aircraft could carry nine Soviet PAV-3 pallets. Maximum payload – 20,000 kg (44,092 lb). There were plans for 20 aircraft, but only nine were converted, two from Tu-154 models and seven from Tu-154B models. Trials were held in the early 1980s and the aircraft was authorized regular operations in 1984. By 1997 all had been retired. The Tu-154M and Tu-154M Lux are the most highly upgraded versions, which first flew in 1982 and entered mass production in 1984. It uses more fuel-efficient Soloviev D-30KU-154 turbofans. Together with significant aerodynamic refinement, this led to much lower fuel consumption hence longer range, as well as lower operating costs. The aircraft has new double-slotted (instead of triple-slotted) flaps, with an extra 36-degree position (in addition to existing 15, 28 and 45-degree positions on older versions), which allows reduction of noise on approach. It also has a relocated auxiliary power unit and numerous other improvements. Maximum takeoff weight increased first to 100,000 kg (220,462 lb), then to 102,000 kg (224,872 lb). Some aircraft are certified to 104,000 kg (229,281 lb). About 320 were manufactured. Mass production ended in 2006, though limited manufacturing continued as of January 2009. No new airframes have been built since the early 1990s, and production since then involved assembling aircraft from components on hand. Chinese Tu-154MD electronic intelligence aircraft carry a large-size synthetic aperture radar (SAR) under their mainframe. Cosmonaut trainer. This was a salon VIP aircraft modified to train cosmonauts to fly the Buran reusable spacecraft, the Soviet equivalent of the US Space Shuttle. The Tu-154 was used because the Buran required a steep descent, which the Tu-154 was capable of replicating. The cabin featured trainee workstations, one of which was identical to the Buran's flightdeck. The forward baggage compartment was converted into a camera bay, as the aircraft was used to train cosmonauts in observation and photographic techniques. Germany modified one of the Tu-154s it inherited from the former East German Air Force into an observation airplane. This aircraft was involved with the Open Skies inspection flights. It was converted at the Elbe Aircraft Plant (Elbe Flugzeugwerke) in Dresden, and flew in 1996. After 24 monitoring missions, it was lost in a mid-air collision in 1997. The Russians also converted a Tu-154M to serve as an Open Skies monitoring aircraft. They used the Tu-154M-LK-1, and converted it to a Tu-154M-ON. When not flying over North America, it is used to ferry cosmonauts. China is believed[according to whom?] to have converted one Tu-154 to an electronic countermeasures aircraft. Design of this variant started in 1994, but the first aircraft were not delivered until 1998. It is an upgraded version with Western avionics, including the Flight Management Computer, GPS, EGPWS, TCAS, and other modern systems. The airplane could carry up to 157 passengers. The cabin featured an automatic oxygen system and larger overhead bins. Three were produced, as payment of debts owed by Russia to Slovakia. Three aircraft were delivered in 1998 to Slovak Airlines, and sold back to Russia in 2003. 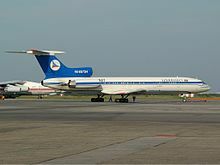 Wikimedia Commons has media related to Tupolev Tu-154.